This past week I worked with a customer who was interested in a round brilliant cut diamond and asked if I could provide an ASET image. An ASET image is a light performance picture that was introduced by the American Gemological Society as a tool to show how light behaves in a particular diamond. AGS is a competing gemological laboratory to the Gemological Institute of America (GIA), and they use ASET images to show how the diamond interacts with light in order to reflect the overall cut grade. The name ASET stands for Angular Spectrum Evaluation Tool, and evaluates light performance as confirmed by the cut. My customer was interested in a 1.70ct excellent cut diamond, but was concerned about discrepancies in sparkle between GIA excellent cut options. 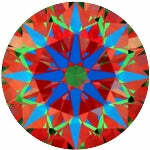 He had looked at diamonds locally and felt that the excellent cut was not consistent among the stones he looked at. The diamond I selected for him was a 1.70ct G color, VS2 clarity with excellent cut, excellent polish, & excellent symmetry, also known as a triple X. Triple X diamonds from the GIA are considered the brightest, liveliest diamonds one can purchase. Unfortunately, being a GIA certified diamond, we were unable to provide the customer with an ASET image. Despite the premium quality of the stone, the customer was still not convinced that the diamond would perform as well as other excellent cut options. The story ends not with an ASET test, but rather a different diamond cut grade test alltogether. This test proved to my customer that the GIA’s excellent cut grade was accurate. 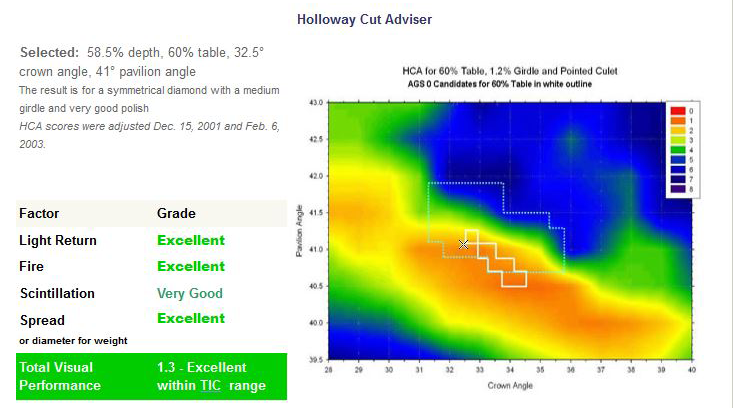 The Holloway Cut Adviser is a different tool to evaluate a diamond’s cut. The Holloway Cut Adviser rates diamond cut on a scale of 0-10, whereby most people prefer stones that rate 1-2 on the scale. 0-2 constitutes an excellent cut grade, although a score of zero is unlikely because of the factors conflict with each other. For example, fire and brilliance conversely affect one another. Above are the results of the diamond that I recommended, which even surprised myself as how well it scored I guess I really know how to pick them!